This beautiful and spacious apartment is ideal for visitors to Paris on either business or leisure trips with family or friends. Its privileged location in the 4th arrondissement near the well-known Place de la Bastille, in the historical district of Marais, provides a perfect spot from which to visit and fully enjoy the most beautiful monuments and museums in the city. Its narrow little streets dating back to the Middle Ages, unusual locations and unique hotels soaked in history give Marais a true picturesque charm that makes it one of the best preserved districts in the city. The Seine, the Ile Saint-Louis, and the famous Place des Vosges, are all located in a radius of just five minutes walk from the accommodation. At Port de lArsenal in the Place de la Bastille; location of the Opera lending its name, it is possible to take one of the unique cruise boats along the canal de Saint-Martin, and pass through the romantic locks well loved by the Parisians. It is easy and fast to move around the city with the Bastille metro station just 150 metres away and on metro Line 1, opened in 1900 for the Universal Exhibition. The metro leads directly to the Louvre Museum, Concorde and the magnificent Champs Elysées. There are also numerous shops, restaurants and bars in the surrounding area that will satisfy even the most demanding tastes. This beautiful 50m2 apartment is situated on the second floor of a typical Marais building (without a lift) and can comfortably sleep up to four people. Its layout, furnishing and tasteful decoration have been designed for the most pleasant stay. Overlooking a pleasant interior patio area the building has been classified as a monument of historical heritage, in a particularly light and tranquil location that also adds to its special atmosphere. Two bedrooms are both fitted with a double bed, there is also a spacious lounge with a large, comfortable sofa. A flat screen television, DVD, HI-FI system, telephone and internet WIFI connection are also available for your work or pleasure. The kitchen is fully equipped with everything you might need for your stay. The pleasant bathroom is fitted with sink, heated tail rack and bath - a great option for a relaxing finish to a busy days walking around the streets of Paris. Check in from 4pm. Before 4pm, on request subject to avaibility with an additional cost of 40. This apartment has a maximum capacity of 4 guests, not including babies under 2 years of age. However if a group includes babies, the maximum capacity, including any babies, is 5. I was really pleased with the condition of this accomodation. We (4 persons) really enjoyed our weekend there very much. 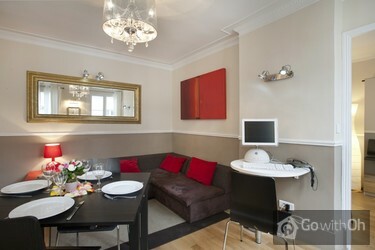 The flat was absolutely as described if not more: imac, flat screen, very comfy beds, all working and extremely clean. Excellent location: 2 min walking from Tube #1(which cuts Paris from side to side) and bus #86 (which gets you to the best evening spots: Marais & St Germain). Upon arrival we ...noticed the towels were still in the washing machine (little misunderstanding with the cleaning lady): they were promptly and kindly replaced. Just one note: the sister's owner was happy to get the deposit through cheque, while the website states cash. Much better (and cheaper) than many hotels %u2013 will definitely repeat the experience! Een zeer goed uitgerust appartement, mooi aangekleed, schoon. Voor herhaling vatbaar. I found the bathroom and toilet areas to be uncomfortably small but thoroughly enjoyed everything else. Having to be at the apartment at certain times to meet the contact person was I felt a little intrusive and inconvenient. The contact person however was extremely polite and helpful. 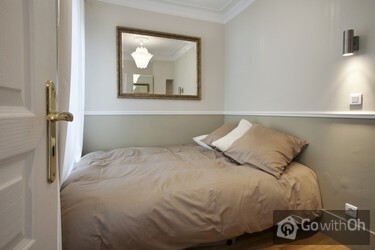 Great clean and comfortable apartment in central location. Very friendly and helpful owner. Thanks. Lovely appartment in a wonderfull place. equippment of the kitchen could be better. Die Wohnung ist sehr schön eingerichtet, liegt zentral aber ruhig. An excellent apartment. Well located, well appointed and Laurent was excellent. Can't wait to stay again. The person who met us with the keys was a different person than who we contacted via email. It was not made clear before hand that we had to meet another person. Aunque la escalera de acceso da un poco de miedo por lo antigua y pequeña, el apartamento es todo lo contrario. Todo nuevo y recientemente reformado, con camas de 1'50x2'00 m y colchones cómodos. Solo le falta extractor de humos a la minicocina. Ottima la posizione, vicino a Place de la Bastille, con fermata Metro (Bastille) a due passi. L'appartamento è un pò piccolo per 4 persone (noi eravamo due coppie), soprattutto il wc... ma ci si adatta abbastanza facilmente... (per Parigi questo e altro)... in ogni caso può andare bene se il ...soggiorno è breve o se non si intende trascorrere la vacanza molto tempo chiusi in appartamento. Qualche piccolo problema con lo scarico della vasca/doccia (un pò lento).. per il resto tutto Ok... soprattutto il proprietario, molto gentile e disponibile. Die Lage ist super, die Unterkunft ist etwas kleiner als sie auf den Fotos erscheint, mehr als 4 Leute sollten dort nicht wohnen. Die Küche ist gut ausgestatt und der Vermieter ist sehr freundlich und hilfsbereit. Die Wohnung ist im Hinterhof und daher sehr ruhig, die Betten sind gut. Todo ok, el acceso al apartamento es un poco incómodo por las escaleras.. En general todo muy limpio y muy bien presentado. Die Unterkunft hatte eine gute Lage, sehr kurze Wege zur Metro. Jedoch könnte die Wohnung sauberer und gepflegter sein. Der Eigentümer bestätigt, alle notwendigen Maßnahmen zu treffen, um einen guten Zustand der Wohnung sicherzustellen. L could not have been more hospitable or helpful. He was very anxious that the apartment was as we expected, that we had everything we needed and whether we needed any advice. The apartment was lovely and clean, in a great location, very safe, close to loads of restaurants (Bofinger is just over ...the road! ), patisseries, a supermarket and a wine shop where the staff gave great wine recommendations - 5 min walk to Isle St Louis, 3 mins to Bastille - right near the Metro and main bus routes if you wanted to get further into town. Couldn't have been better! WC etwas mini!! Sonst alles bestens!! Die Unterkunft ist sehr gepflegt, sauber, wirkt frisch renoviert, ist mit allem Nötigen ausgestattet und zeichnet sich zudem durch ihre tolle Lage in einem schönen Viertel aus. Die U-Bahn sowie diverse Geschäfte und Lokale sind in der Nähe und man kann auch zu Fuß etliche Sehenswürdigkeiten ...und schöne Orte erreichen. Einzig der auf dem Foto abgebildete Computer war nicht vorhanden, das WC ist recht eng, es gibt Herdplatten aber keinen Ofen und im kleineren Zimmer kann das Bett nur von einer Längsseite aus betreten werden, da die anderen 3 Seiten an der Wand stehen, was uns aber nicht wirklich störte, weshalb wir die Unterkunft auf alle Fälle wieder buchen würden und sie auch bereits weiterempfohlen haben. Die Kontaktperson L. war zudem sehr freundlich, hilfsbereit und zeitlich für die Abwicklung der Bezahlung und Kautionsrückerstattung flexibel. Er nahm sich auch Zeit uns diverse Tipps für die Stadtbesichtigung zu geben und uns ein Taxi für die Rückfahrt zum Flughafen zu bestellen. Auch war es in unserem Fall möglich erst um 15h auszuchecken, was sehr angenehm war, da unser Flug erst später ging. Fazit: Für 4 Personen ist dieses Appartement eine gute Wahl! We were very happy with the apartment. It was clean, very quiet for a peaceful night's sleep and perfectly located, minutes from the metro and easy to get to from CDG via RER and metro. L. was very friendly and helpful. We would stay here again when we return to Paris. Wir haben den Aufenthalt sehr genossen. Die Wohnung ist zentral aber durch die Lage in einem Innenhof total ruhig. Sie ist gut ausgestattet. Die beiden getrennten kleinen Schlafzimmer verfügen über sehr bequeme Betten mit guten Matratzen, die ausziehbare Couch im Wohn/Esszimmer hat unseren ...strapazierten Beinen nach den langen Paris-Touren gut getan. Kurzum: Klein und fein! Der Besitzer war sehr freundlich und entgegenkommend, wir kommen gerne wieder. Das Vermittlungsservice hat gut geklappt, nur eine Anregung: Bitte darauf hinweisen, dass Antwortmails bzw. die Kontaktmails des Vermieters auch im Spamordner landen können. Das war bei uns der Fall, konnte aber dann durch direkten telefonischen Kontakt aufgeklärt werden. Eine herrlich ruhige Wohnung in absolut zentraler Lage, die genau das hielt, was die Beschreibung versprach. Wir haben uns hier sehr wohl und sicher gefühlt. Das Marais ist ein wunderschönes Stadtviertel, direkt um die Ecke gab es Einkaufsmöglichkeiten für den täglichen Bedarf und zwei ...Bäckereien. Auch die U-Bahn war um die Ecke. Einfach toll! Sehr freundlicher und unkomplizierter Ansprechpartner des Vermieters. Vielen Dank! Sehr geschmackvoll eingerichtetes Appartment. Gute Lage für die Erkundung des Marais. Zu viert sehr gut nutzbar. no comments, everything went well. Everything you could need, quiet area but only a few minutes walk to cafes, metro, small supermarket and greengrocers etc. The contact person was extremely helpful and the apartment was was just as described. We would definitely stay here again and have already recommended it to our friends. Eine sehr schöne Wohnung, mitten in Paris und durch die Innenhof-Lage sehr ruhig. 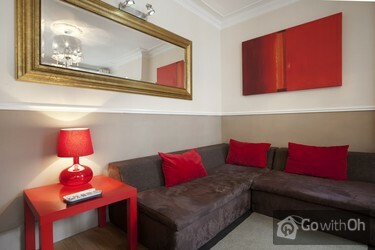 The apartment was in a great location, was well appointed and was very well maintained. I would definitely recommend it to friends and family. L. the owner was extremely helpful and went out of his way to be of assistance. Sehr schöne Wohnung, ideal gelegen, um Paris zu erkunden. Schlüsselübergabe und Empfang völlig problemlos und einfach. Wir kommen jederzeit gern wieder. It is a great apartment, but unfortunately we had a bad experience with the guy the proprietary sent to clean the apartment in our last day - he was a bit rude. Advertised as having an oven, but did not have one. Dear customer, OH thanks you for your comments, as they help us to improve the quality of our services every day. The owner confirms that the apartment does not have an oven, so we proceeded to remove the equipment from the kitchen listed online. We apologise for the inconvenience this may have caused you. lovely apartment, great location, we were without sheets for just under 24 hours for one of the rooms but the person of contact who was very good brought them very quickly and all was fine! Great place, exactly as advertised, good communication with unit owner and manager. Super close to metro, bakery, groceries, etc. Central location within walking distance to many of the main things a tourist wants to see/do in Paris. Es ist eine gemütliche kleine Wohnung,in der man sich sehr wohl fühlt.Die Lage ist top und die Kontaktperson sehr freundlich.Alles in allem kann ich diese Wohnung empfehlen! Nice, clean appartment, and quiet, the bed comfortable,the metro very near. the contact person very polite and came on time.Good heating. Incroyablement calme, literie très confortable. Tout le reste très bien. A recommander ! Die Fotos hat ein guter Fotograf gemacht, denn es sah leider nicht so reinlich und aufgeräumt aus wie auf den Bildern. Wir haben es sogar sauberer hinterlassen als wie wir es vorfanden. Die Kontakt- Person war alles andere als freundlich. Die lage ist allerdings echt gut. We had a wonderful time in this well-located, well-equipped apartment, it absolutely met our expectations. The owner is correct and flexible. The flat is close to a wide variety of shops and a market (Place Aligre) and we recommend to visit Chez Margot for dinner. L the Manager/Owner was very helpful. 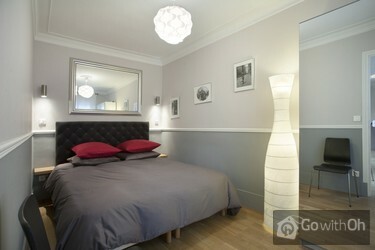 The apartment was in an excellent position close to Bastille metro which made getting around a breeze. We found the apartment ok the 2nd bedroom was very tight @not much wardrobe space.We did not use the kitchen utenils as they were a little dodgy.We believe ...the stains may have been from calcium in the water.The dish washer was still full from the last people as we only made coffee we didn't need to use it Our toilet was the size of a postage stamp our 6ft. son found it difficult to close the door. The shower was in the bath plus the bathroom a tight squeeze only 1 person at a time . The stairs "2 sets" were quite steep & slippery we would not stay anywhere again that did not have a lift. If it's position you are after you may over look the negatives & go for it. Site of toilet is good for a 2 bedroom apartment because access does not require passing through either of the two bedrooms.In this apartment crockery provided was very limited.Only 1 plate suitable for soup or cereals.Wardrobe in double bedroom was pulling away from its fixture to the wall.Cleaning was poor-accumulated dust around edges of floors.. This was a perfect apartment for a family of 4 to overcome jet lag.. Very quiet, excellent location near the metro, and easy to find and access the apartment. Super gelegen Wohnung. Sehr ruhige Lage, da im Hinterhaus. Nur zu empfehlen. La estancia fue perfecta para un viaje de cuatro amigas. Ideal también para familias si bien al no haber ascensor es más complicado el tema de llevar cochecitos o silletas. El dueño es un encanto y estuvo muy dispuesto a ayudarnos en lo que hiciera falta. La zona es excelente, con todos los ...servicios al lado (metro, supermercado, farmacias, cafés) y es un piso silencioso. Volvería sin dudarlo. The apartment is in a great location to explore Paris. The metro stop is about 300m from the door. The apartment itself is in a quiet courtyard and is very secure. The two bedrooms are great if you're travelling with kids. The main room is well furnished and was freshly cleaned when we arrived. ...There are supermarkets, boulangeries, chemists, restaurants and bars all within easy walking distance. Lis a pleasure to deal with and was very professional and friendly from start to finish. We would definitely stay there again. Im Vorfeld: Perfekte Kommunikation in Englisch. Die Ankunft war vom Vermieter perfekt vorbereitet. Wir konnten die Wohnung unproblematisch und ohne Zeitverzug beziehen. Sehr netter und unkomplizierter Vermieter. Toll eingerichtete Wohnung im Herzen der Stadt. Die Metro Bastille ist nur 2 Minuten von... der Wohnung entfernt. Die Wohnung ist überraschend ruhig gelegen, was am Innenhof liegt. Rund um die Wohnung liegen diverse Restaurants, Kaffees, Supermärkte. Wir waren mit zwei Kindern (5 und 8) unterwegs. Besser hätten wir es nicht treffen können. Wenn wir wieder nach Paris (auch zu zweit) fahren, würden wir die Wohnung jederzeit wieder buchen. Very good accommodation, the location excellent, the person of contact extremely nice and very helpful indeed. We would highly recommend this apartment to anyone. Klein appartement maar met alles erop en eraan. Prima voor 3 nachten. Schoon en contact met eigenaar ook prima. Just what you need in Paris city center, a good bed, bath/shower and a place to sit down. We did not use the kitchen (lots of good restaurants around: tip Gorille Blanc, just a few blocks away), but it is nice to have a fridge for cold water/sodas. Toilet is very small, but then you don't intent to stay there for a long period. My husband and I travelled to Paris with his parents and stayed in this wonderful apartment for 3 nights. The apartment is situated in a fantastic location for exploring; it's close to the metro and if you enjoy walking, Notre Dame and Le Maris area is within easy reach. We also found some excellent... restuarants and bars close by. L the owner was extremely helpful and accomodated us with a late check out on our last day. The apartment is very well equipe, spotlessly clean and a perfect size for 4 adults. 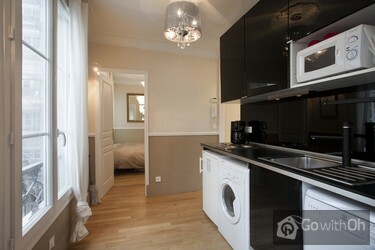 I would definitely reccomend this apartment and if I return to Paris I will stay here again. We have been in the flat for one week and enjoyed it very much. It is a nice and clean little apartment. It was perfect for us, a family of four. Especially that the location is central. You can reach a lot in walking distance. The flat is very quiet. L. is very nice and helpful. Have been here with 4 persons for one week and felt very comfortable. Very nice and clean apartment equipped with everything you need. The contact person is highly friendly and helpfull. Conversation in english is no problem. The location is perfect: very quiet, close to Metro (Bastille), ...supermarkets and restaurants (Rue Saint-Antoine/Rue de Rivoli), close to river Seine (400m). If I come back to Paris I would choose this apartment again without doubt. Das Appartement entspricht genau den Bildern und der Beschreibung. Da die Schlafzimmer zum Innenhof ausgerichtet sind, ist es auch in der Nacht schön ruhig. Sie ist für zwei Päärchen sehr gut geeignet. Sehr zu empfehlen. Man hat umliegend genug Bäcker und einen Supermarkt, um sich mit dem ...Nötigsten auszustatten. Man ist zu Fuß in ca. 10 bis 15 Minuten am Notre Dame, also sehr zentral. Das Viertel ist Abends sehr belebt, man muss also nicht weit laufen um im Zentrum des Nachtlebens zu sein. Die Kontaktperson ist sehr freundlich und es hat alles reibungslos geklappt. Mein nächster Aufenthalt in Paris wird wieder in diesem Appartement sein. Wir waren sehr zufrieden. Great location, close to shops and a bakery just around the corner. 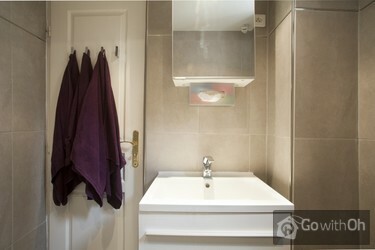 Clean and tidy apartment with all amenities. Laurent was very helpful and the apartment in a fantastic position (also very quiet) with excellent facilities. Stairs might be a problem for those not very agile and with a lot of luggage but not a problem for us. Overall very, very pleased. A good location , close to metro, shopping, restaurants. It was all very easy and well organised, everything went really smoothly and we were very happy. 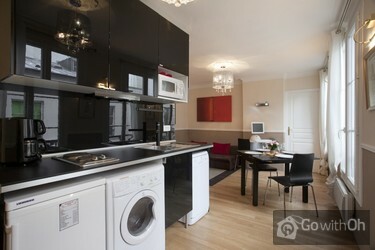 The apartment was clean and stylish and wonderfully situated for exploring Paris, both on foot and by Metro. ???????? ????? ?, ????? ?, ????? ?????? ??????????- ? ????? ?, ?? ???? ??????? ? ???????? ?????? ??????? ???? ? ????? ?? ??????. ????? ???? ?, ??????????? ? ???????????? ? ?????????????? ??????????! ????? ??????? ?- ????????? ???? ? ?????????????. Very clean comfortable apartment and in an excellent location short walk to a major metro station and many of the points of interest.i would highly recommend this apartment. Tolle Wohnung, sympathischer Kontakt: wir waren hoch zufrieden! L. was so helpful and pleasant. Location superb with lots of great restaurants nearby. 10 mins walk from notre dame, and only 45 mins on train from airport (change at gard du nord). Our children are 10 and 13 and the apartment was perfect for all 4 of us. Strongly recommend. 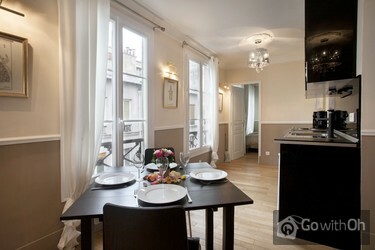 Very neat and clean apartment close to Notre Dame and easy to get to hop on hop off bus! Loved surrounding area! Apartment would not be suitable for elderly because of stairs but suited us fine! Todo muy a gusto, el propietario en horario y atento. Disfrutamos en familia Paris ! !El unico inconveniente fue cargar las valijas dos pisos por escaleras, pero es tipico en Paris. It is compact but well designed for 2 couples and is very well equipped.It overlooks an internal courtyard and is quiet and secure.The owner speaks good english and is obliging and professional in his dealings with his tenants. We would rent this apartment again and recommend it to others. The apartment is great - a bit used since the pictures were originally taken, which is to be expected, however its perfectly suitable for a family or two couples for a long weekend.A couple of things I think its worth knowing in advance though:1) There's an additional 40 charge if you want access ...before 4pm, which if you have a morning flight is likely2) Its on the 2nd floor up two narrow spiral staircases (lovely, and typically parisien, but not necessarily practical for small kids or anyone with mobility issues)Clean and tidy, with all the necessities and WIFI. Nice and quiet, but in a great location just off Bastille with plenty of little cafes nearby and a Monoprix supermarket 5 mins away. I would definitely use this apartment again for future visits. Ruhige und dennoch zentrale Lage. Nach technischen Pannen und Missverständnissen bei der Ankunft war es dann ein guter Kontakt. Die Küche ist für große Kocherlebnisse nicht ausgestattet; war für uns aber so i.O. Die Einrichtung der Wohnung entspricht nicht mehr ganz der Bebilderung. TV - außer... "arte" - keine deutschen Kanäle. Sehr gutes wifi. Bei den anfänglichen Schwierigkeiten: Paris, Berufsverkehr und Auto steht auf der Straße, Parkverbot und kein Kontakt zum Vermieter hätten wir uns mehr Kooperation gewünscht. It was absolutely perfect, very clean, everything as listed on the website, really nice apartment. The owner was very helpful, I locked myself out and he did everything possible to help me. Highly highly recommendable. Sehr nette Kontaktperson, die sich sehr gekümmert hat. Kommunikation mittels Englisch kein Problem.Sehr schöne und ruhige Wohnung, die auch noch sehr zentral gelegen ist.Kann man wirklich weiterempfehlen ! There was no computer in the room like displayed on the pictures. Maybe the owner should take new pictures? ?The owner was very rude when we first met. Due to a mis communication he said to me over the phone that he has a very important job and that we will have to wait for when he has time to bring ...the keys. We had to small kids and had to wait with all our luggage from 5pm until 8pm in front of the building. The kids were so tired and the owner didn't care. I was in tears after our phone call as he was very rude because he had to wait for us. In future don't say in the email that there will be a key in the post box and that we have to phone him once inside the apartment. Because of that I was under the impression that we don't have to be there a specific time. De bedden waren prima en het appartement heel save en rustig, terwijl het toch midden in het centrum van Parijs ligt.Heel compleet met wasmachine en afwasmachine. Alleen koken op 2 pitten ging ons niet heel gemakkelijk af. We komen zeker terug. Supermarkt en bakker vlakbij. Wirklich tolle und zentrale Lage in Metro Nähe. trotz dem ruhig. Kuechenausstattung spaerlich. The owner, L, responded immediately to all correspondance both before our visit and during our visit. The apartment was in a great location but also very quiet at night. We will definitely return here. tolle zentrale Lage und trotzdem ganz ruhig!Sauberer und gepflegter Zustand, alles funktionierte einwandfrei.Die Betten sind sehr gut, relativ fest: die Besten in denen wir in Frankreich je schliefen!! Wir waren 100% zufrieden mit allem! Die Wohnung hat uns sehr gut gefallen und wir sind dort sehr freundlich aufgenommen worden. Es hat alles bestens geklappt. Great location. The apartment had everything we needed and was very comfortable. An authentic French feel. We received a very warm welcome from the owner who was extremely helpful. Nice & warm in the winter. 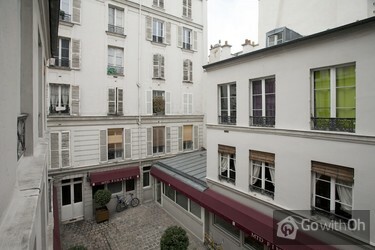 Walking distance to great restaurants, transport & Victor Hugo's Paris. Will be very happy to stay there again. 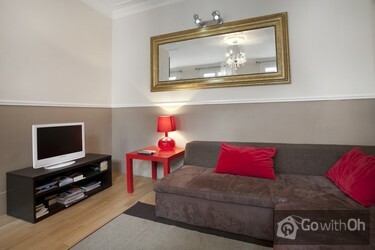 Lovely apartment, great location, owner very helpful. All in all a perfect stay. Whilst small and compact (the apartment has the world's smallest separate toilet!) we had everything we needed and were very comfortable. The facilities are in good condition. The apartment is well-laid out. We felt very much at home and L was very helpful answering all our questions and was ...available if we had any further queries. It sounds like access issues on arrival have been improved since earlier comments and we had noIt was ideal accommodation for myself, my husband and teenage daughter. It was quiet and there is good security. We stayed for 6 days mid-April. It is close to the Bastille metro and there are a lot of interesting cafes, restaurants, and food shops located near by. 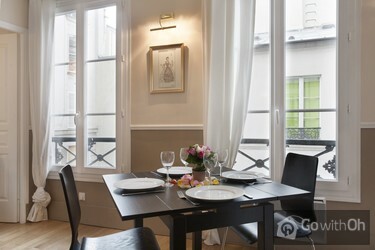 The apartment is also a short walk from the Seine river, and the Notre Dame is a 10-15 minute walk. Dit appartement is zeer compleet, ligt op een mooie locatie en was beschikbaar tegen een vriendelijke prijs.De contactpersoon was aardig en heeft al onze vragen beantwoord.Goede supermarkt en bakker dichtbij.De inrichting wordt al wat sleets, tafeltje voor de koffiebekers bij de bank mist. ...Daarentegen wel een kledingkast in slaapkamer 2.Het appartement was redelijk schoongemaakt, de vaatwasser kon wel een sopje gebruiken. Owner was very helpful, apartment was compact but lacked nothing for self containment. We would stay here again. Location was excellent and the apartment was very comfortable for our 3 night stay. Beds were comfortable, the lounge area was quite roomy and the kitchen was basic but sufficient for what we wanted.Only downside would be that not all the lights were working and there was very little leg room in ...the toilet, a tall person would find it very difficult to use. The owner was very kind, the location was very god, Close to the metro, nice and safe area, quiet at night. We missed a Chair at the table, only three and we were four. More lamps did not have light, but the appartment was nice and clean. Appartement très bien situé près de Bastille, très calme car donnant sur une cour intérieur. Assez spacieux et confortable. Idéal avec des enfants. Propriétaire accomodant et accueillant. Great location with bakeries, supermarkets, butchers, restaurants all located near by. The apartment itself was very secure and the instructions provided were fantastic for collecting of keys and gaining access. Laurent was extremely helpful. Would most definitely recommend this appartment for up to 4 adults comfortably. Ein tolles Apartment in perfekter Lage. Außer ein paar kaputten Glühbirnen haben wir keinerlei Minuspunkte zu vergeben. Das Appartement ist absolut empfehlenswert! Die Lage ist unschlagbar: In nur einer Minute ist die Metro-Station zu erreichen, die Verbindungen in alle Richtungen ermöglicht. Zu Fuß ist Notre Dame in etwa 10 Minuten zu erreichen. Ein Supermarkt und eine Bäckerei (2 Minuten zu Fuß) ermöglichen ...Verpflegung rund um die Uhr. Es gibt ausreichend Platz in der Wohnung, wir waren als Familie mit zwei Kindern unterwegs und die beiden getrennten Schlafzimmer sind herrlich gewesen. Für Amüsement sorgte das winzige WC, aber auch das war letztlich kein Problem. Wir fühlten uns sehr "parisienne" durch die geschmackvolle Ausstattung der Wohnung, die absolut ruhig und sicher liegt. Wir werden ganz sicher wiederkommen und sagen Merci für den wunderschönen Aufenthalt. Das Beste ist die Lage. Die Wohnungseinrichtung entspricht nicht den Fotos. Die Sofasitze sind stark verfleckt, das Sofa komplett abgenutzt. Der gesamte Eindruck der Wohnung ist ungepflegt, es wurden offensichtliche Mängel, wie ausgerissene Gardinen, defekte Leuchten, verschimmelte Baddecke, nicht behoben. El apartamento está excelentemente bien situado. Pero era muy básico en cuanto a que eran muy limitados los utensilios de cocina, la sartén estaba muy estropeada, no había nada para limpiar la encimera de la cocina. El propietario era muy amable y nos atendió bien, si bien no apareció hasta el día siguiente. We arrived late in the evening and all the instructions left for us by the owner were easy to follow. The next morning we discovered what a fantastic location we were in. The metro is a 2min walk from the apartment which made life so easy. Just past the metro on Thursdays and Sundays is the most ...amazing farmers markets, that is a must! From the apartment turn left head down the street and you reach the main street with everything you possibly could need, including a fantastic bakery. The apartment was small but everything we needed for our family of four, yes the world's smallest toilet but totally manageable. The apartment was clean and cosy and the location really was brilliant. Great apartment in a great area! The owner was wonderful to deal with in every regard. Bonne situation dans Paris, près de la Bastille, à proximité de bus, métros, et de commerces ( Monoprix, Franfrix, boulangeries...) permettant des achats pour les repas. Die Lage ist super. Mit der Wohnung waren wir nicht sehr zufrieden. Sie hat leider Mängel. Fast kaum heisses Wasser, defekte Lampen, teilweise unsauber. Sie entspricht nicht mehr genau der Fotos. Wir haben den Vermieter auf die Mängel aufmerksam gemacht. Er hat aber nichts dagegen unternommen.